The many facets of Italian regional cooking are to be celebrated January 17, during the 2012 International Day of Italian Cuisines (IDIC). This year’s official dish is ossobuco , and cooks from all over the world are invited to make this dish and send in their photos. You can sign-up to participate, or just make it because you feel like it. I enjoy sampling this dish in Milan to fortify myself before embarking on our walking tour in the Italian Lakes that encompasses Lake Como and Lake Iseo. Ossobuco, which means “hollow bone”, is a traditional dish from Milan, and is made with veal shanks that are slowly braised in a rich broth. At the end of cooking, the traditional ossobuco recipe calls for the veal shanks to be topped with a finely minced gremolata of lemon rind, parsley and garlic. The marrow of the bone is considered a delicacy and is meant to be scooped out and eaten, in delicious ignorance of its cholesterol content. The milanesi actually have a long handled spoon just for this purpose, which has the amusing name of esattore – tax collector. Ossobuco is a rich dish that is often served with the equally rich risotto alla milanese, but I like it with simple polenta or mashed potatoes to soak up every bit of flavorful sauce. The veal shanks themselves should be tender and juicy, or as poet Billy Collins described “soft as the leg of an angel / who has lived a purely airborne existence”. I’m not sure what Billy was drinking when he wrote that, but you can try to reach these lofty heights with the ossobuco recipe at the end of this post. A good bottle of Barbaresco should do the rest. 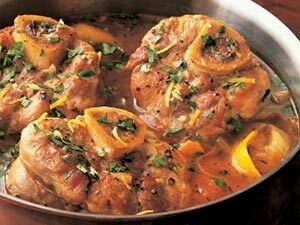 Heat the oil and butter in an ovenproof pan that is just large enough to tightly hold the veal shanks in one layer. Pat the veal shanks dry with a paper towel, and sear them in the butter and oil over medium heat, turning to brown evenly. Put the heat on low, remove the veal shanks and set aside. Over a low flame, sauté the carrots, celery and onion in the same pan (this mixture of veggies is called a soffritto,) scraping the bottom of the pan with a large spoon to mix in any brown bits, being careful this soffritto doesn’t burn. When the vegetables are soft, add the wine and turn the heat up. Stir occasionally until wine is almost evaporated, then add the tomato and broth and stir to blend. Place the browned veal shanks in one layer in the casserole, and spoon some of the vegetables over the top-the shanks should be covered with the broth. Cover the pan and place over a very low flame for about 90 minutes (or place in preheated oven (350° F (180°) . Remove the cover and cook for another 30 minutes. Finely mince the lemon rind, parsley and garlic together – this is the gremolata which will added just before serving. When the veal is done, place it on a warm platter and skim excess fat from pan, and bring to a simmer, adding a bit more broth if it is too dry. Spoon the sauce over the veal, sprinkle with the gremolata mixture and serve with polenta or mashed potatoes. Buon appetito!